Publishing data produced by ESP8266 sensors to an MQTT broker server is a great option to making your IoT data visible to outside consumers with minimal consumption of precious MCU bandwidth. Simple, easy to implement and very light-weight. What a great distribution system! Simply publish your ESP8266 sensor data once, and many subscribers can consume the information, virtually at the same time. Sweet! In case you are new to MQTT, here are a few basics. 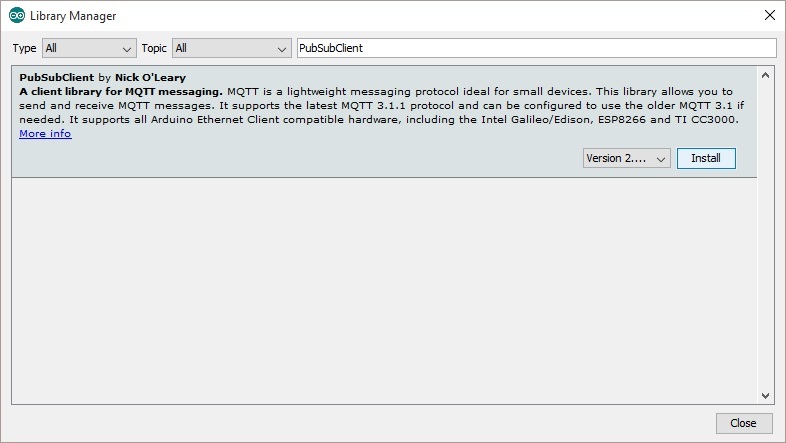 MQTT is the acronym for message queuing telemetry transport. Now that’s a mouthful! It is essentially a protocol that follows the publish/subscribe model to distribute information from one source to many users. For demo purposes, I wanted to use a free broker. 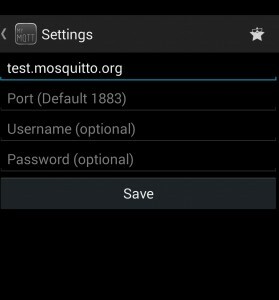 After testing a few of the available options, I settled on using the Mosquitto MQTT server. While unsecured, meaning anyone who knows your “topic” can subscribe to the data, it works great for a proving out your design. Step 3: Enter “PubSubClient” in the search box. But there is one more thing to do after installing PubSubClient. I have found that the default maximum packet size (128 bytes) is insufficient. You should at least double it to 256 bytes. And loop() maintains the Wifi and MQTT connections, reads the sensors, and publishes the values to the MQTT broker. #define wifi_password Your Wifi password"
#define mqtt_user "not used in this example"
#define mqtt_password "not used in this example"
The loop() simply makes sure a connection to the MQTT is made, reads the sensors, and publishes the results. The publish rate is set at 2 seconds minimum. Just copy and paste this complete sketch as a starting template to test your own MQTT publishing with the ESP8266. 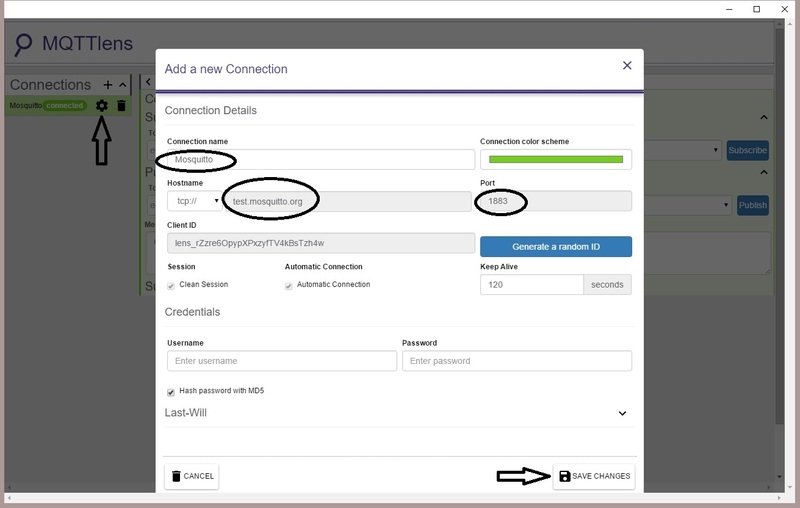 Remember, you will need to set the WIFI ssid & password in the sketch to your access point values before running. While there are many tools available, here are a few I have found that you can use to verify the ESP8266 is actually publishing the data. Simply subscribe to the topic and watch the information updates in real-time. First try using MQTTLens, an off-the-shelf tool to subscribe to the published data. You can get MQTTLens here. Although this app is installed via Google Chrome, it runs as standalone application. At this time, Chrome apps are supported using Windows, Mac and Linux operating systems. 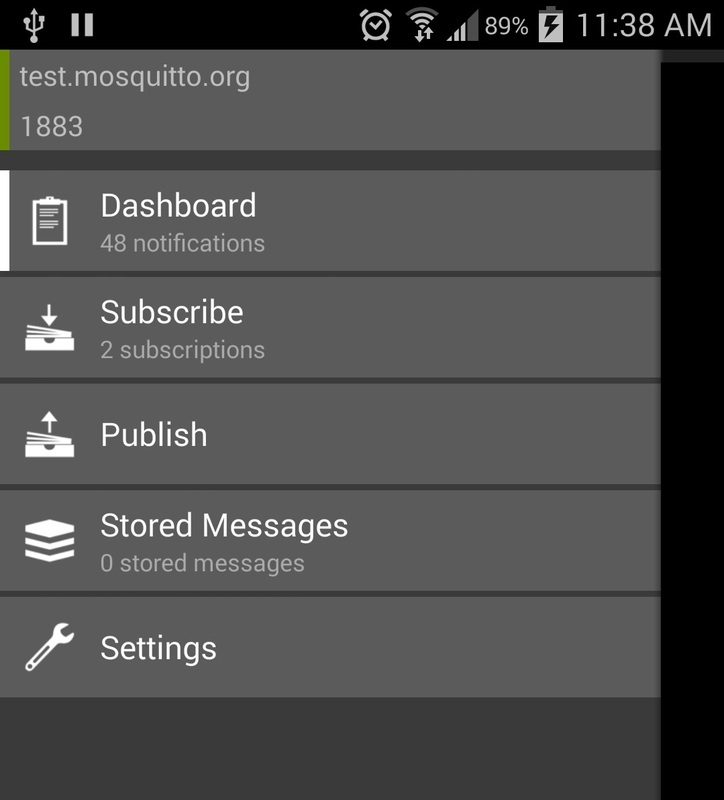 This app provides basic functionality for testing MQTT publish/subscribe messages. 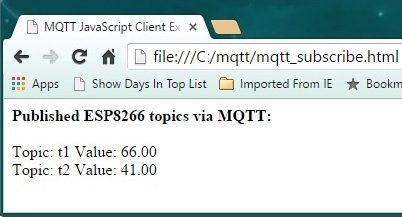 Once the app has been installed and started, a few configuration steps are needed to connect to our MQTT broker and subscribe to the ESP8266 published topics. Once you are connected to the broker, the only thing left to do is subscribe to the data feed. For this example, two topics are published by the ESP8266; t1 and t2. Enter one of these and click on the subscribe button to monitor the data as it is published. Notice you can change the number of messages displayed using the “-+” icons. MQTTLens is a great tool to get a quick look at your MQTT published data. But when you move from merely testing the data feed to developing a custom application, full control to manipulate and display the information is essential. 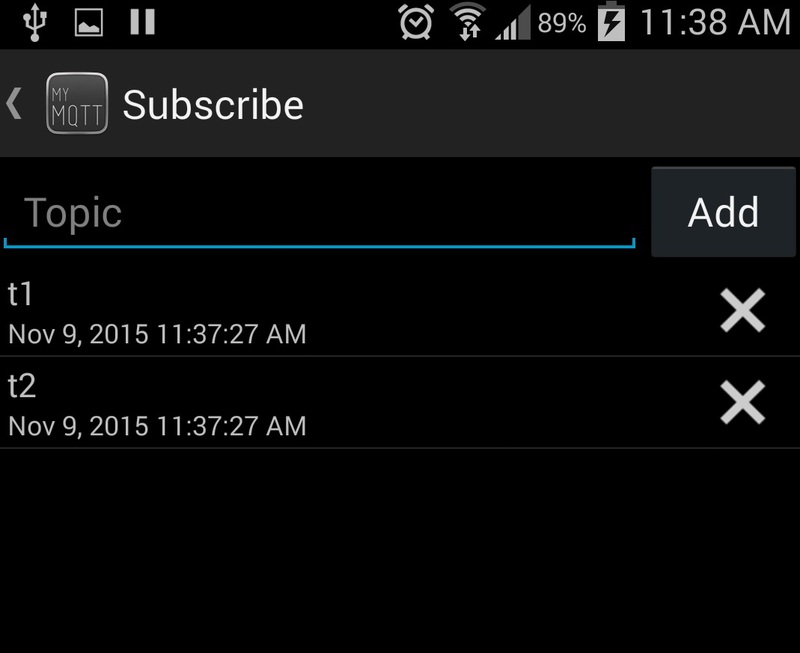 I’ve developed the following html code to subscribe to the ESP8266 published data. This may be useful as a template on your own website. Simply open a file with this code in a web browser to test. Name this file as you please, using “.html” as the file name extension. 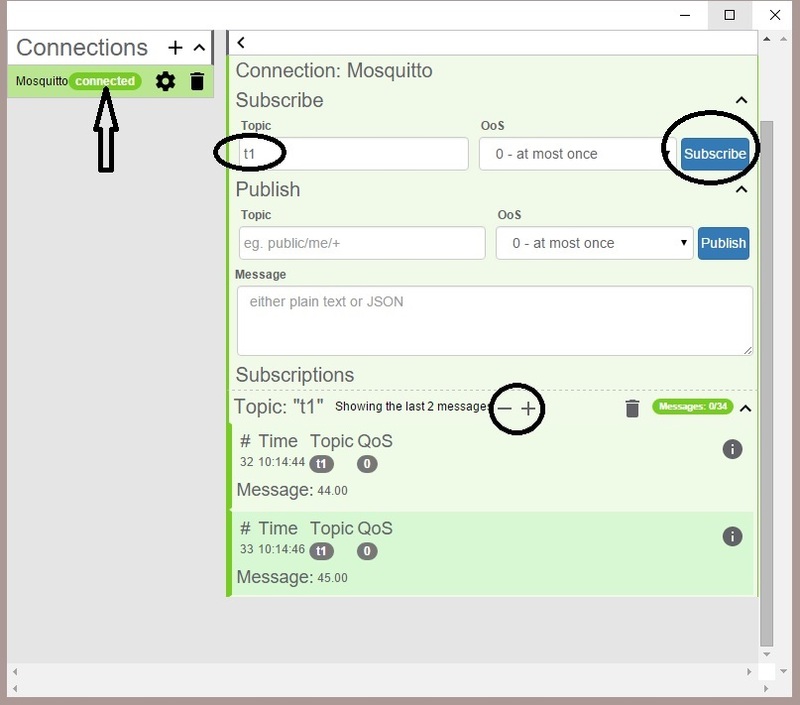 In this example, I have named the file “mqtt_subscribe.html”. 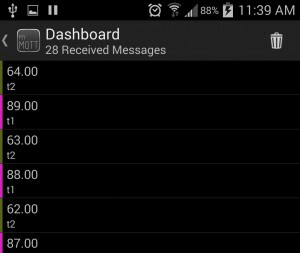 While I have not yet explored the development of a custom Android App to interface with an MQTT broker, it is certainly possible. 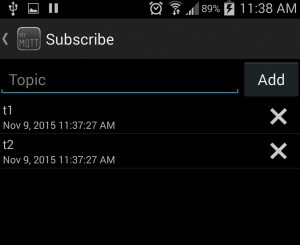 What immediately comes to mind, in the spirit of App portable, would be to develop an Android Cordova App. This would allow you to reuse the above html code, without modification. Here is my step-by-step guide to get started. But if you are looking for an off-the-shelf MQTT test application, I recommend using MyMQTT . This is a free App available in Google Play Store. 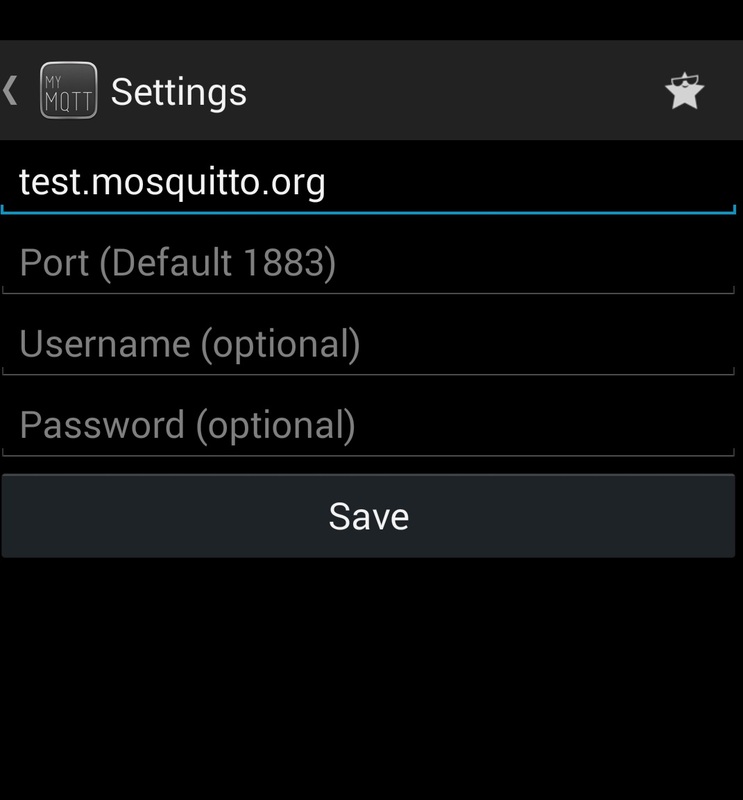 Once installed, there are only a few steps needed to subscribe to the ESP8266 example MQTT feed. MQTTInspector is the most popular App to test MQTT feeds from an iOS device. At $1.99, is not free, yet certainly low-cost. As a Windows, Android and Linux user, I cannot provide any additional information regarding this tool. It appears to be similar to other MQTT client test tools, and can be found on iTunes here. Here you have it. A simple guide to publishing topics from an ESP8266 device to an MQTT broker. All you need is a simple Arduino IDE sketch. 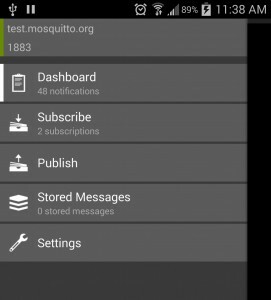 Once published, this data feed can be consumed cross-platform, on any device that supports MQTT. From this article, this includes but is certainly not limited to Windows, Mac and iOS. There are also Linux packages available to support MQTT clients.